The Runnymede was a wooden whaler built in Hobart in 1849. She was driven ashore by strong winds and wrecked in Frenchman Bay in 1881 alongside the wreck of the Fanny Nicholson that had been blown ashore nearly a decade earlier. These events were reported in the Hobart Mercury at the time. Sections of the hulls of the two vessels are occasionally uncovered after huge volumes of sand are swept away. Identifying the wrecks has turned out to be a challenge even for the experts. If the two wrecks are the Runnymede and the Fanny Nicholson then it is unclear which is which. It is even possible that one of the wrecks is that of a third vessel. Fortunately, the remains are likely to be well preserved while they sit under tons of sand. Exposure to the air would cause them to quickly disintegrate. Every few years, under the right conditions, it is possible to catch a glimpse before they are totally hidden from view. In this second, close-up photo the twin planking of the hull can be seen to be held together by brass dowels. In the 19th and early 20th Century small vessels known as ‘lighters’ were used to haul cargo and supplies to and from ships anchored in Vancouver Sound. These flat-bottomed craft sat low on the water were not powered: they had to be towed by larger vessels. Some were crudely made; they were basically workhorses. One such lighter was the Elvie whose remnants are still visible today on Whalers Beach. The Elvie was built in Fremantle shipyards in the 1890s from local jarrah timbers and was licensed in 1903. In 1915 the Elvie was sold to the Norwegian Spermacet Whaling Company to transport barrels of oil from its shore station in Frenchman Bay to ships anchored in deep water. The lighter left Fremantle in June 1915, towed by the Company’s whaling steamer, the Klem. 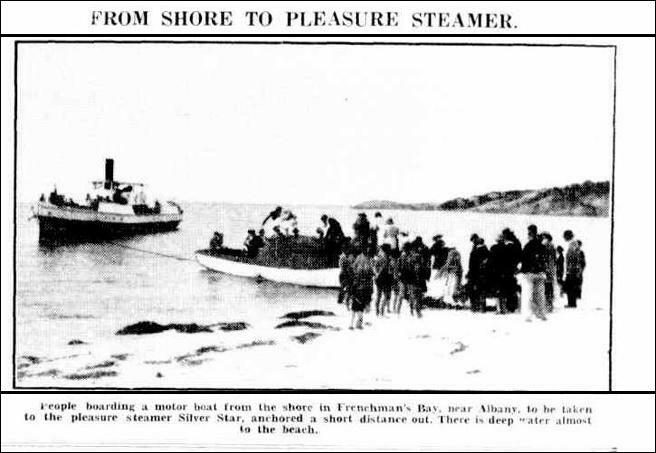 The lighter had a short working life in Albany since the whaling station closed some months later. The Company salvaged some of the most valuable factory equipment and shipped it to its station on the northwest coast at Point Cloates but left behind the Elvie and another lighter, the Fran. In 1921 a gale blew the Elvie and the Fran ashore. The Fran was eventually lost from sight but the Elvie was lodged on the beach at its present site. In the 1922 photo an Albany resident, Mrs Hartman is shown sitting on the side of the intact hulk. A degree of protection from vandalism was provided by the remoteness of Whalers Beach; a road was not constructed until 1928. Unfortunately the remains of the vessel were progressively pillaged for firewood and most of the above-ground structure disappeared. The lower sections were preserved under tons of beach sand, though occasionally revealed after heavy storms. One such storm in 2002 exposed a section of the hull and shifted it along the beach. Residents at Goode Beach recovered the section, preserved it, and installed it above Whalers Beach as shown in the photo below. The rough-hewn jarrah ribs are clearly visible. Over the years there have been several archaeological examinations of the wreck. The photo below shows the exposed timbers at the time of an archaeological examination in 1991. While the remains are almost certainly those of the Elvie, one old-timer believed that the Elvie had been shipped to Albany by the Norwegians. Given that the wooden material has been shown to be jarrah, that hypothesis seems improbable, unless of course the timbers belong to some other, unnamed vessel. 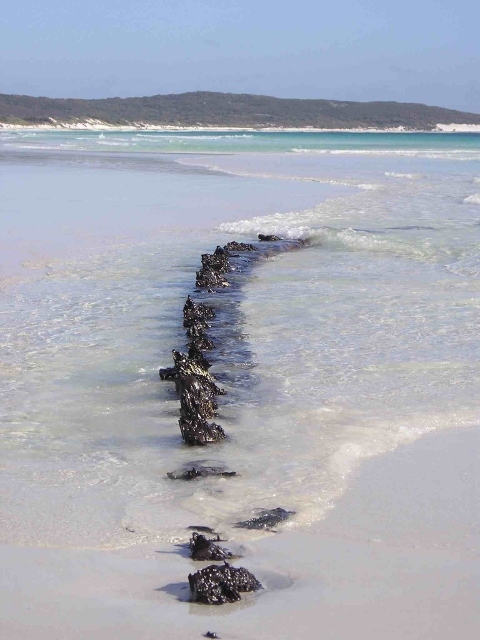 Another hypothesis is that the remains are the wreck of a locally built lighter constructed on the Kalgan River from timbers salvaged from the abandoned whaling station. There is photographic evidence that shows that such a craft existed. You can look at the archaeological evidence in the well-illustrated report on the internet. The shipping notice of the tow of the Elvie by the Klem is found in the West Australian of 15 June 1915. 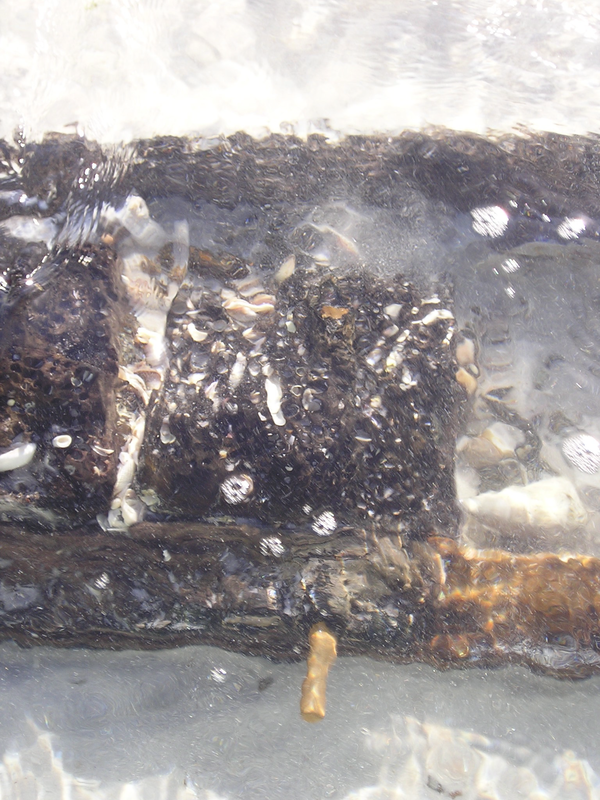 For more information on the archaeological investigations see: Boocock, A., Bower, R., Coroneos, C., McKinnon, R., Marshall, G., 1990, Survey of Wrecks, Frenchman Bay, Albany. Report – Department of Maritime Archaeology, Western Australian Museum, No. 50.